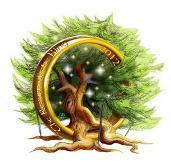 This August I took part in the Tolkien Society’s major event since 2005, The Return of the Ring (16-20 August), a celebration of Tolkien on the occasion of the 75th anniversary of the publication of The Hobbit. This was a five-day event that interweaved academic lectures and papers, fan activities and presentations, an art exhibition and book stalls, and prestigious keynote addresses. The Guest of Honour this time was Brian Sibley, best known for his BBC Radio 4’s acclaimed adaptation of The Lord of the Rings. 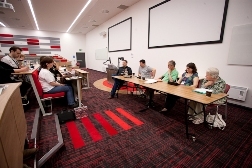 Other plenary addresses included speakers such as Tom Shippey, Verlyn Flieger, and J.R.R. Tolkien’s grandson, Michael Tolkien, who talked about the influence of his grandfather’s essay ‘On Fairy-Stories’ on his own creative work. I was honoured to be one of the special guests, alongside many other scholars, artists and performers. My talk focused on “Elves, Goblins and Other ‘Fairy’ Things in The Hobbit: Tolkien’s Victorian and Edwardian Inspiration” (see here for an abstract) which expanded my research on fairies in Tolkien’s early work (published in my book) to the period of The Hobbit. I was also very excited to take part in an event that run parallel with the main sessions of Return of the Ring: a Postgraduate Symposium in which younger scholars, who are currently studying Tolkien at MA and PhD level, were given the opportunity to present their research and share ideas. Alongside Martin Barker (University of Aberystwyth), Mark Atherton (Oxford University), and Corey Olsen (Washington College) I led a number of those postgraduate sessions, and was very impressed with the standard of papers and research presented. It was also very rewarding to see some of my own former Tolkien online students presenting at this conference, including Sara Brown, Sandra Hall, Andrew Higgins, Sonja Virta and Elise McKenna. In addition, I was involved with organising four discussion panels on Tolkien and Education focusing on “Tolkien in International Higher Education” (which I chaired), “Tolkien and Literary Tourism”, “Tolkien Research” and “Lifelong Learning Tolkien: Face-to-face and Online” (in which I took part as a speaker). I also signed copies of my book and was one of the judges who selected the scholar who gave the Christine Davidson Memorial lecture and received the accompanying bursary (we had a wonderful lecture by Benjamin Barootes!) Overall, Return of the Ring was a great event – it was lovely to see so many colleagues and friends and talk Tolkien continuously for five days! In early September, the Tolkien Library published an interview with me on teaching and researching Tolkien, in which I repeated an announcement I initially made at Return of the Ring: that my Tolkien online course will run this autumn term (starting on 19th September) for the last time for some time, as I am intending to take a break from teaching online for a year or so. So here’s your last chance to enrol for a little while! For more information on my Tolkien online course please see this video presentation, and here is the link to enrol!